Before 22 November 1963 the name of Lee Harvey Oswald was unknown. Since that day it has become notorious as the assassin of the most charismatic American president of the 20th century. However, Oswald was not to live to enjoy that infamy. At around 12.05am on Saturday 23 November Lee Harvey Oswald appeared before the press in the basement of City Hall at 2001 Commerce Street in Dallas. He denied all knowledge of the killing. At 1.30am he was formally arraigned with the murder of the president. At 10.25am the police again began to question Oswald. At 3.30pm Oswald received a visit from his brother, Robert. At 4.35pm he appeared at the number two spot in a line-up alongside W.E. Perry (under number one), Richard L. Clark (three) and Don Ables (four), and was identified as Officer Tippit’s killer by witness, Helen Markham. At 6pm, he faced more questions from the police. At 9.30am the next day, preparations were made to transport Oswald from his fifth floor cell to the local jail. At 11.15am the fateful journey began. 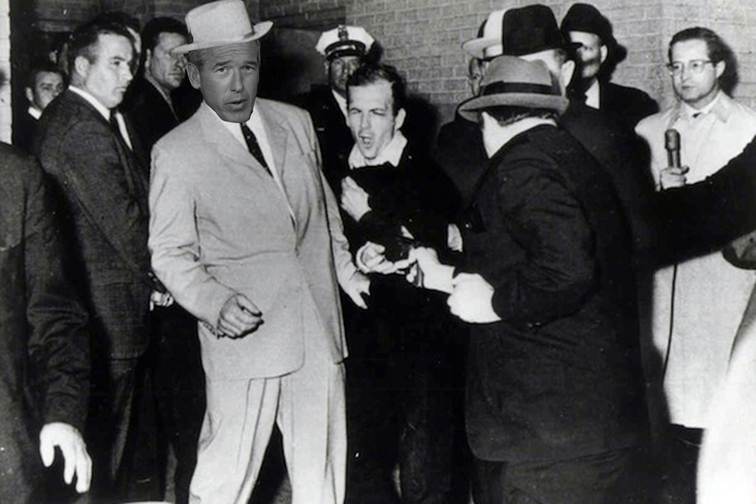 Six minutes later, as the handcuffed Lee Harvey Oswald was being led to a waiting vehicle, Jack Ruby, a 52-year-old local nightclub owner, shot him in the stomach with a Colt Cobra .38, shouting, “You killed my president, you rat”. The assassination was watched on television by millions, the first time a murder was seen live. Oswald died without regaining consciousness. At 1.07pm —47 hours and 53 minutes after JFK died — Oswald was pronounced dead at Parkland Memorial Hospital where his victim, the president, had been taken two days earlier. Jack Ruby was arrested and charged with murder on 26 November 1963. On 14 March 1964, after a brief jury deliberation, he was convicted of murder with malice and sentenced to death. On 5 October 1966 the conviction and the death sentence were overturned. On 9 December 1966 Ruby was taken into hospital suffering from pneumonia. As preparations were being made for a second trial, Ruby died on 3 January 1967 of a pulmonary embolism at Parkland Memorial Hospital — which meant that the president, his assassin and the assassin’s murderer all died in the same place.